In case you missed previous posts: Day 1, Day 2, Day 3 and Day 4. Our final day at Nkenijii Primary School has been the toughest for me to write about. You can probably tell given that I'm just now posting three weeks after returning from Kenya. I felt a sense of finality as soon as I woke up that Friday. Last early morning "Jambo" outside the tent Julie and I shared. Last bumpy van excursion to Nkenijii. Last time being greeted by beautiful students wearing purple along with big smiles. Last time for the week or forever? I couldn't know. When I got out of the van, I looked for my special buddies, among them Steven, Diana, Esther and Sylvia. As always, Steven found me quickly and soon after, my big girls. But Diana wasn't around. She had arrived at school late other days, but I worried that maybe she wouldn't make it to school today and I would miss my chance to say goodbye to the sweet, shy little girl. When I finally spotted Diana sometime after 10 am, I was so relieved I almost cried. The tiny enigma in the red party dress and I would get a proper goodbye. My duties at school on Friday involved helping the nurses as they did final examinations of kids previously been deemed in need of follow-up care and then shutting down the clinic. After we volunteers ate a box lunch in the classroom that had been the clinic, it was time for closing ceremonies. Like at Mpopongi the day before, we were given seats of honor in front of village elders. School personnel made presentations about why we should continue investing in Nkenijii and then (to be honest, quite a while later), the students made presentations. 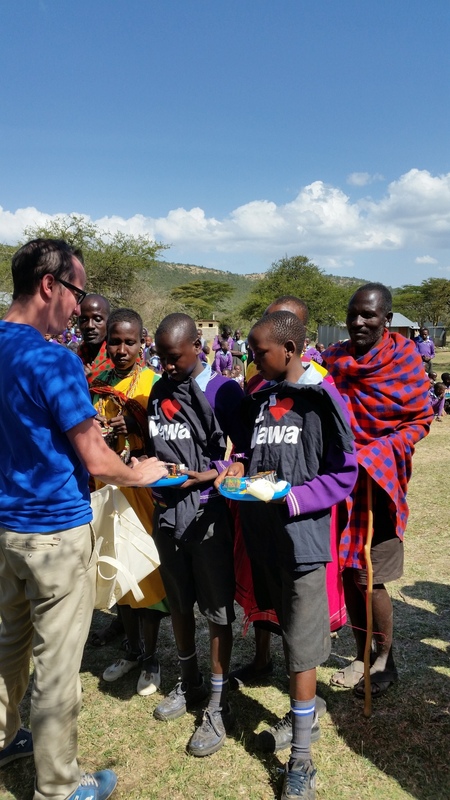 Our young friends, including Steven, had changed out of school uniforms and into traditional Maasai attire. I was moved just seeing their transformation--impressed before they even began performing. Steven's smile was so big as he made eye contact with me throughout. I felt proud like a parent. My big girls, Esther and Sylvia, were part of a group that sang a personalized song to some of us volunteers. I thought my heart might explode when they sang my name. The presentations concluded with each volunteer being presented with a gift from his or her buddy's family, and reciprocating with simple gifts from the United States. I had already met Steven's mother, who works as the cook at Nkenijii and lives in the girls' dorm, but it was my first time meeting Steven's father. I was given a beautiful beaded necklace and bracelet made by Steven's mother. 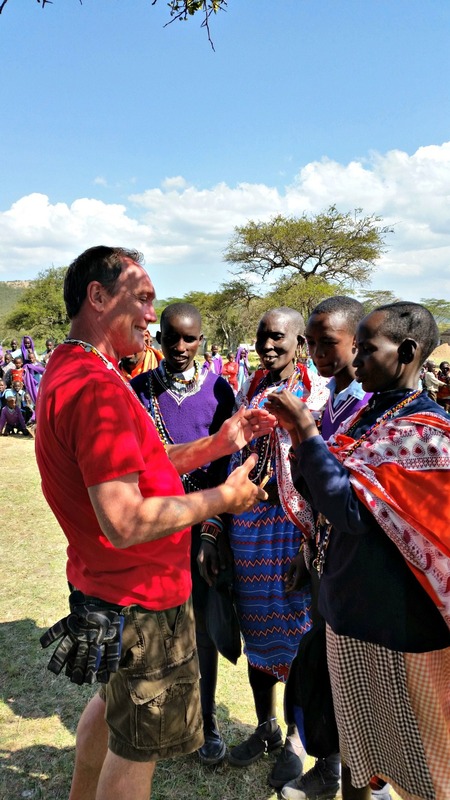 Having witnessed the simplicity in which our Maasai friends live, the value and feeling behind the gifts were not lost on me. Earlier in the day, I had enjoyed a conversation with a woman named Elizabeth who I had wrongly assumed was employed by the school in some way. Looking back, I should have noticed that her clothes were different, and her hair style too. Perhaps her accent. After we finished our chat, I didn't give Elizabeth much more thought--I was focused on the students and my experience of the last day. After the students' presentations, we had the opportunity to browse some Maasai-made wares before getting in our vans for the trip back to Siana Springs. The vendors had laid out jewelry, carvings and other mementos on blankets. That's where I found Elizabeth and among the items she had for sale, there was a pink beaded necklace. We went through the motions of negotiating the price, as is the custom, and then the necklace was mine. After talking a bit more, we parted. Soon after, my young friend Sylvia approached me and said, "I want you to meet my mother." She was very excited. We didn't have far to walk: her mother? Elizabeth. Our warm acquaintance suddenly became even more so. We hugged and I congratulated her on the loveliness of her daughter. Soon, I was crying. The connectedness and (I keep using this word) warmth of the community struck a chord in me. As we embraced, Elizabeth too began crying. Sylvia, on the other hand, thought this was all very funny. Esther? She did not. Soon she hugged and held me. Which made my minor boo-hoo-ing progress to sobs. I couldn't stop or hide my tears out of self consciousness. I just let them fall. The emotions I felt were pure, honest and real. During one short week at Nkenijii, I had met people who I cared about, and the reality was that I might never see them again and might not know what happened next in their lives. Knowing that hurt, but I wouldn't change the time we all spent together even a tiny bit. I think about these wonderful people I spent time with every single day, and I hope to see them again, perhaps has soon as next summer.